Here in Los Angeles, Kings fans know all about the awesome Can-Am duo of Drew Doughty and Jack Johnson. 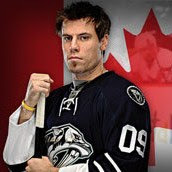 Yet, over in Nashville, they have their own dynamic pair of young blueliners in Shea Weber and Ryan Suter. Back in the February the four were part of one of the best hockey games you’ll ever see, when Canada took on the U.S. in the gold-medal game at the Vancouver Olympics. Doughty and Weber helped lead Canada to a win that day over Johnson, Suter and the Americans. MM: We’re only a month into the season and the two teams haven’t met yet. What do you know about the Kings so far this year? SW: Well we know they’re a very good team. I think they’re first in the NHL right now. We’ve got to be prepared and make sure we’re ready to go. We need two points, they need two points – so it’s going to be a good battle. We’ll see what happens. Nashville is a competitive team year in and year out. Besides the consistency of coach Barry Trotz, is there anything else you attribute the success to? I don’t know if you can really put a finger on it. We just have such a great group of guys in the locker room and when guys go down other guys step up and play bigger roles. I think we’re deep enough that we can do that. Guys that come up from the minors are great. Guys that are already on the team play play their minutes and know their role. Speaking of guys going down, Matthew Lombardi signed with the Predators as a free agent this summer and he’s only been able to play in two games so far due to a concussion. When he’s healthy, what will he mean to the team this year? Well, it hurts to have him injured right now because he’s a great player. He really speeds up our team. He’s one of the fastest guys in the league and he makes everyone else around him faster as well. Another guy injured right now is Ryan Suter. Do you have to change your game at all when another big piece of the defense is out of the line-up? No, I don’t think I really try to change. Obviously, when you play with a guy for so long you get used to his tendencies. But I think you just have to get into a groove with another partner and try to use some of what they do too. Everyone on the back end is a great defenseman and they’re in the NHL for a reason. So, we’re just pushing forward.